Dry red chilly - 4 nos. Soak the tamarind in 1/2 cup of water and squeeze out the pulp. Add turmeric powder and salt to that, mix well. Keep aside. Heat a pan with 1/2 tsp of oil and fry the dry red chilly, peppercorns, cumin seeds, thuvar dal, channa dal, urad dal, coriander seeds, Hing and curry leaves, one by one till they come to a light golden in colour. Cool the mixture and grind it with little water to make a coarse paste, not a smooth paste. Now mix the grounded paste into the already ready tamarind water and combine well without any lumps. Heat a kadai with sesame oil and the cooking oil and do the tempering once the oil gets heated. Add the mustard seeds and wait for few secs to finsih popping, then throw in the curry leaves and the shallots, stir together well for 1 minute on medium flame until the shallots turn glossy and cooked. 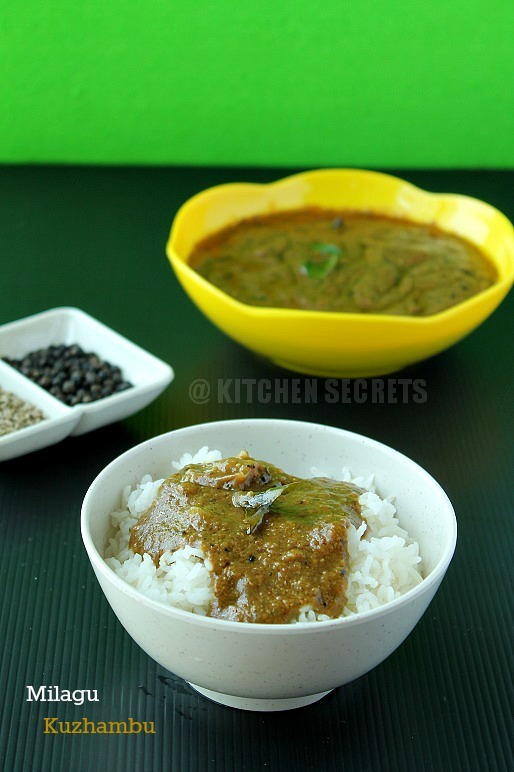 Pour in the prepared kulambu gravy and combine well. Check the salt, add if more required. 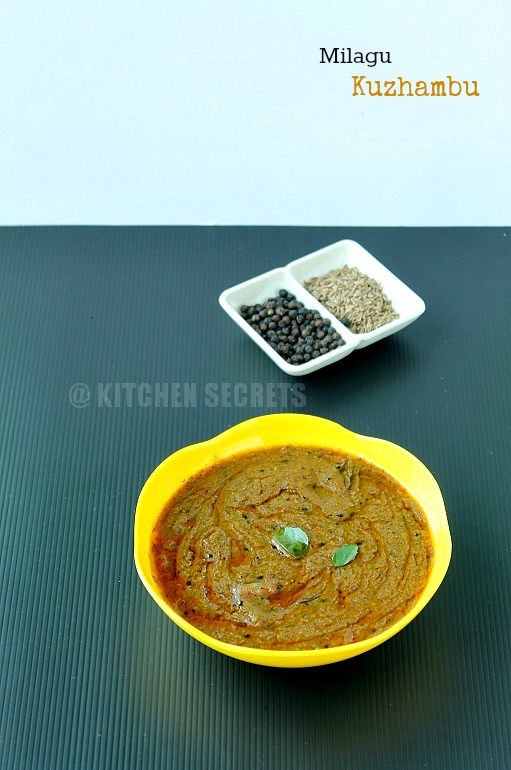 Cover and cook the kuzhambu for 4 to 5 minutes. Finally add the powdered jaggery and combine well again. Again cook for 2 to 3 minutes or just until oil floats on top. Serve with steamed rice, appalam. Tastes wonderfully great. The gravy is little spicy so add a little when you mix with rice. But it's good for health, esp when sick and cold. Jaggery is not added in general, but I've added to bring down the spiciness to some extent. It's better to use sesame oil for this gravy and it gives a unique flavour as well. This measurement is enough for a family of 4 to 6 servings. Delicious and yummy looking kuzabmbu. nice clicks.. like the oil over the curry.. very tempting..
wowww super aromatic khuzampu,wish to have with rice n papad!! My fav. looks very tempting. Milagu kuzhambu looks so perfect.love all your pictures.